Programmed death ligand 1 (PD-L1) is a cell membrane protein that binds to programmed cell death protein 1 (PD-1) on the effector T cells and transduces immunosuppressive signals. It is now clear that the expression of the PD-L1 protein on the tumor cell surface is critical for tumor cells to escape immunosuppression. At present, more attention is focused on the transcriptional regulation of PDL1 mRNA. 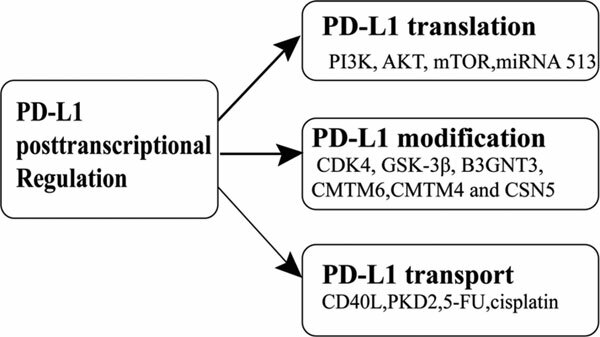 However, PD-L1 protein is the functional unit involved in immunotherapy response. It is essential to deeply understand how this membrane protein is regulated post-transcriptionally in tumors and immune cells. In this review, we summarize the recent progress on the translation, modification and transport of PD-L1 protein. Keywords: Programmed death ligand 1 (PD-L1), programmed cell death protein 1 (PD-1), immunotherapy, translation, modification, transport. Keywords:Programmed death ligand 1 (PD-L1), programmed cell death protein 1 (PD-1), immunotherapy, translation, modification, transport. Abstract:Programmed death ligand 1 (PD-L1) is a cell membrane protein that binds to programmed cell death protein 1 (PD-1) on the effector T cells and transduces immunosuppressive signals. It is now clear that the expression of the PD-L1 protein on the tumor cell surface is critical for tumor cells to escape immunosuppression. At present, more attention is focused on the transcriptional regulation of PDL1 mRNA. However, PD-L1 protein is the functional unit involved in immunotherapy response. It is essential to deeply understand how this membrane protein is regulated post-transcriptionally in tumors and immune cells. In this review, we summarize the recent progress on the translation, modification and transport of PD-L1 protein.